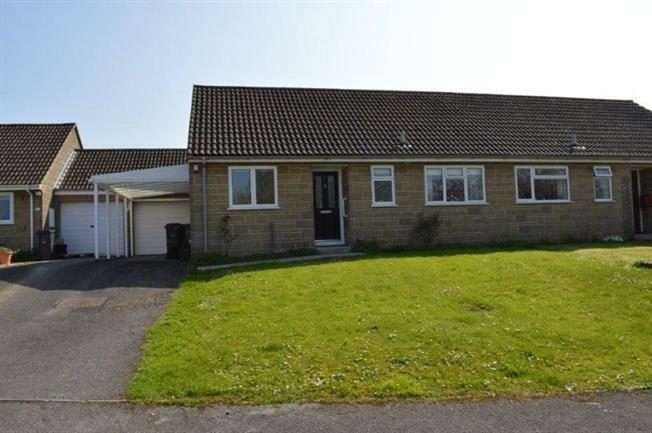 2 Bedroom Semi Detached Bungalow For Sale in Martock for Asking Price £210,000. This spacious semi-detached Bungalow is offered with no onward chain and is located in a sought after peaceful development of similar properties with open countryside nearby. Requiring some updating the property benefits from night storage heating and double glazing. In brief accommodation provides Living Room, Kitchen, Conservatory, Hallway, Bathroom and two Bedrooms. Outside is a driveway with Car Port leading to a single Garage with further WC. Gardens to front and rear with lawn, pathways and patio. Door to Airing cupboard with hot water cylinder, with switch for loft light. Loft hatch. Fireplace surround, sliding patio doors to Conservatory. Sliding patio doors to garden, light and power. Electric panel radiator. Range of wall and base units with worktops over. Tiled splashbacks, eye level electric double oven, electric hob with filter hood over, stainless steel sink unit. Low level WC, panelled bath with shower attachment, pedestal wash hand basin, electric towel rail, tiled walls, shaving point. Up and over door to front, side door to garden. Separate WC, deep ceramic sink unit, light and power, space and plumbing for washing machine. Driveway with parking leading to large Car Port and single Garage. Gardens to front and rear with pathways, lawn, hedging, patio. Rear pedestrian door to Garage. Garden shed.